With the easy access of the internet, more and more people are reading. Yet, not all reading offers the same benefits. Scrolling for headlines or gathering information under 140 characters does not give the same benefits as contemplating through a narrative of a good story. 1. Reading creates a new white matter in the brain. In 2009, a study of 72 children ages 8 to 10 discovered that reading creates a new white matter in the brain, which improves system-wide communication. This white matter carries information between regions of grey matter where information is being processed. Reading helps the information to be processed more efficiently. 2. Reading helps you learn a new language. While reading in one language provides benefits, reading in a foreign language improves your communication skills as well. The regions of your brain involved in spatial navigation and learning new information increase in size. When you learn a new language, your overall memory also improves. Neuroscience also found that language affects regions of your brain involving actions of what you’re reading about. For instance, reading “soap” and “lavender” activates the parts of your brain associated with scent; while it remains inactive when you read “chair”. But if you read “leather chair” your sensory cortex fires up. When you read something that involves physical movement, let’s say “squats”, your motor cortex activates. Athletes are able to master their skills because of having long envisioned their movements. The serve of Serena Williams, the kicks of Conor McGregor, or the bursts of speed of Usain Bolt started off as visions in their minds while they move to achieve the desired proficiency. This is how visualization techniques work. 4. Reading increases your empathy. 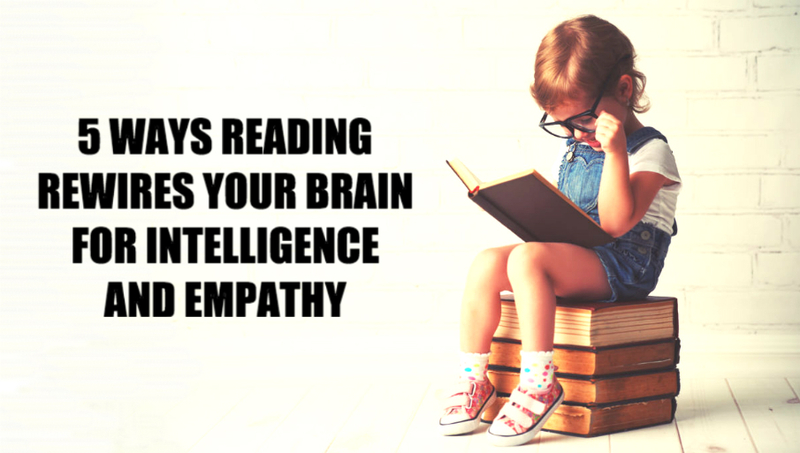 Novel reading is one way of enhancing your empathy. When you’re considerably absorbed with what you’re reading, you come to feel the joy and pain the characters go through, as if you actually experience them. You enter completely into other people’s thoughts. Because of this, you get to see the world through their eyes. This provides a profound implications on your interactions with others. For example, you meet a mischievous 13-year-old boy. Previously, you’ve read about such situation in a book. Instead of summoning your wits for the right actions to take, you based your decisions on the lessons you’ve gathered about how young boys figure out life. And you make your move according to that understanding. 5. Reading helps in comprehension and emotional intelligence. Even when you feel the need to troll someone online for their opinions that you disliked, having an understanding that a true human expressed them makes you choose your words more intelligently and wisely. Research shows that comprehension and emotional intelligence are achieved through reading. Because of it, you’re able to make smarter decisions for yourself and the people around you. In 2011, a study published in the Annual Review of Psychology found an overlap in brain regions used to comprehend stories and networks dedicated to interactions with others. Aside from that, research at Stanford showed a neurological difference between reading for pleasure and focused reading. Blood flows to different neural areas depending on how reading is conducted. Like any other practice, the more you read, the more you increase your reading skills, comprehension, and emotional intelligence. While your purpose of reading might either be to be informed or to be entertained, reading gives you benefits you’re even unaware of. Besides, you can never tell how an engaging story will turn out to be or will make you feel as you immerse yourself in a world beyond space and time.